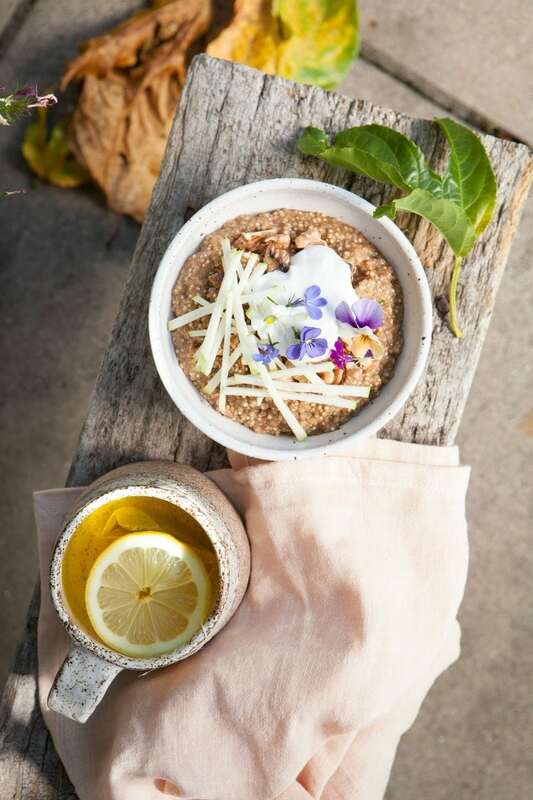 An energetically warming, grounding bowl of nourishment – Coconut Quinoa Porridge cooked with aromatic spices and soft Medjool dates with a handful of toasted walnuts to finish. 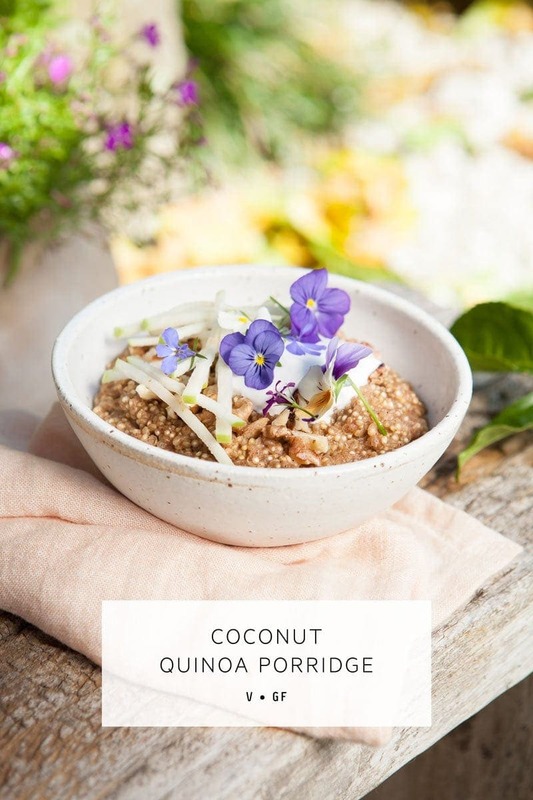 The cooking time for this lovely breakfast is made all the quicker if you sprout the quinoa ahead of time. Autumn is here and for many (particularly us Vata types) it also means we are feeling a little scattered, ungrounded or spacey with that change in weather. Eating according to the seasons is a tried and tested way to keep yourself centred and balanced. I encourage you to have a think for a moment about what the energy of your diet may look like at the moment. Does it include lots of lovely vibrant raw foods? Green smoothies? Juices? Salads? These foods are fabulous in summer for balancing that excess heat, but now that things are cooling down, their energy has a net cooling quality to it. Now think a moment about your own constitution. Are you hot or cold, damp or dry? Do you peel off the layers or seek warmth? Are your hands and feet cool to touch or do others cuddle up to your warmth? Can you tend to perspire easily or is your skin dry to the touch? For some reason, I have observed more cooler, drier constitutions in those who have come to see me in clinic recently. Sometimes this is a person’s natural state, and others, it is simply brought on by a change in weather. Today I’m sharing a recipe that is like a tonic in this autumn weather. It is filled with aromatics – spices that slightly stimulate, circulate, and create warmth in the body. We’re talking Coconut Quinoa Porridge with a generous amount of fresh ginger powder (the spice) and cinnamon. True Cinnamon: because not all cinnamons are equal! Seek quality ingredients and you will be rewarded! There are many varieties of cinnamon, though the most common commercial cinnamon is known as Cassia cinnamon, or Chinese Cinnamon (botanical name, Cinnamomum aromatica) – grown in China. The therapeutic grade cinnamon is known commonly as True Cinnamon or Ceylon Cinnamon, with the botanical name Cinnamomum zeylanicum or Cinnamomum verum. C. vernum is cultivated extensively in Sri Lanka, Madagascar and the Seychelles. ‘Verum’ is Latin for ‘true’. The taste, in my opinion, is far superior – sweet and delicate, so rich in those lovely essential oils. In herbal medicine, we use cinnamon primarily as a digestive remedy, to promote loss of appetite, ease bloating, gas and gastrointestinal spasms, to quell nausea, prevent vomiting and relieve diarrhoea. It is a fantastic warming remedy and helps promote circulation – great for those poor cold hands and feet. Really, this is the spice for those of us with cold, dry constitutions! Ginger is a member of the Zingiberacea family, as are fellow spices turmeric and cardamom. It is a tropical aromatic native to Asia, and the part used is the rhizome. Like cinnamon, this is a warming remedy. In herbal medicine, we use it to calm the gut, reduce gastrointestinal spasms, stimulate digestion, ease nausea and vomiting, and promote circulation to the periphery (another one to warm those paws up!). It is a well-known anti-inflammatory and also has a diaphoretic action – meaning it can promote a bit of a sweat which can be useful to help break a fever. Quinoa, as you may know, is a complete protein source, and a great alternative to gluten containing grains. 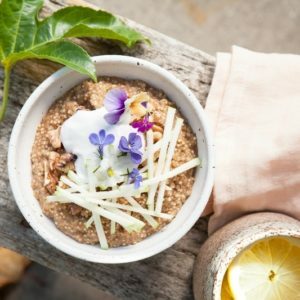 Energetically warming, quinoa tends to be a little bitter, due to the saponins it contains. Sprouting quinoa will help to remove this bitterness and improve the taste. I know some people are a little terrified at the thought of having to sprout everything before cooking – but let me assure you, this truly is such an easy process. The night before you are ready to cook, soak your quinoa in ample water overnight, draining and rinsing well in the morning. You should be able to see the little spirals have unravelled – success! If the seeds don’t sprout, it is likely they aren’t fresh. I find the white variety sprouts the easiest. Another benefit of sprouting of course, is that the cooking time is halved. Please don’t stress too much about this – it will still be delicious if you simply rinse the quinoa well under running water. Medjool dates provide just a hint of sweetness, and are energetically thought to help build strength, moisten, lubricate and help dispel cold. Walnuts are nutritive and thought to promote Ojas or the fluid of life in Ayurveda. Another great Vata food. I hope this finds its way into you breakfast rotation as it is truly delicious. Please note however I’ve gone full force with the amount of ginger and cinnamon in this recipe – I love my spices as you know! A big bowl of this always puts warmth in my belly, particularly when its accompanied with a nice hot cuppa tea. 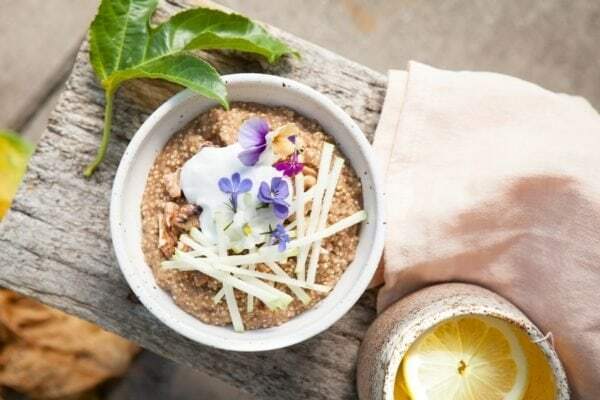 An energetically warming, grounding bowl of nourishment – Coconut Quinoa Porridge cooked with aromatic spices and soft Medjool dates with a handful of toasted walnuts to finish. 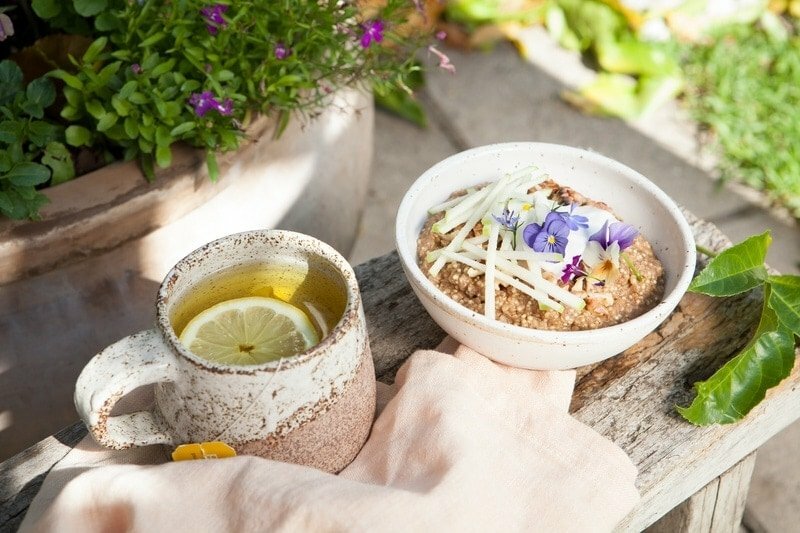 The cooking time for this lovely breakfast is made all the quicker if you sprout the quinoa ahead of time. Naturally gluten free, vegan. 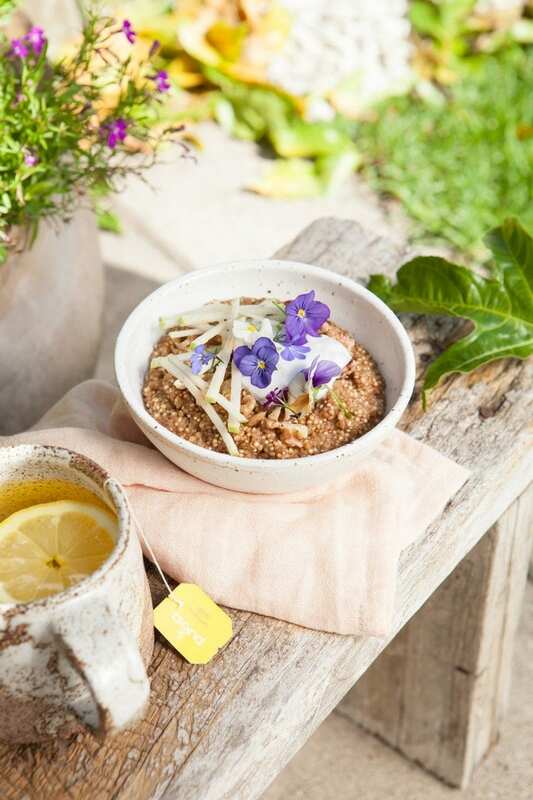 Enjoy as is or make it extra pretty with a few slices of apple a dollop of coconut yoghurt, and perhaps a couple of edible flowers. This first step is optional: the night before, soak the quinoa in ample water then drain and rinse well ready to cook. Add rinsed quinoa to a small pot with coconut milk, water, spices, sea salt and chopped dates. Cover and bring to a boil, then reduce to a simmer and cook for about 10 minutes – not too long – you want some liquid still left (not like my photos – I got side tracked with the shoot!). Note, if you sprouted the quinoa, cooking time is halved – and it may be best to cook uncovered. Meanwhile, toast walnuts in a pan then roughly chop. 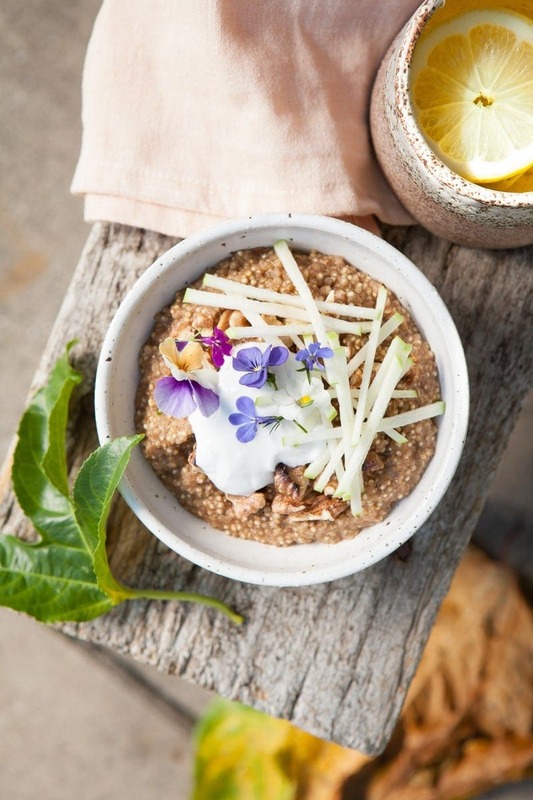 Serve the porridge with chopped nuts and perhaps a dollop of coconut yoghurt and some sliced apple.